Tygon Beverage Tubing is specially formulated for transferring a wide varietyof beverages including soft drinks, fruit juices, flavored teas and bottled water. In virtually all cases, Tygon Beverage Tubing will not affect the taste or odor of product transferred through it, whileits excellent non-wetting properties facilitate complete drainage andpermit simple flush-cleaning. Many of the unique properties inherent to Tygon Beverage Tubing also apply to a widevariety of complex applications ranging from fine cosmetic production to the dispensing ofwater-based printing inks found in the publishing industry. The versatilityand proven performance of Tygon Beverage Tubing have made it today's mostwidely specified clear, flexible plastic tubing. 2.Some fluids can be absorbed by tubing material or can extract substances from tubing material. It is the responsibility of theend user and/or device manufacturer or assembly designer to specify and document tubing performance and safety requirements. 3.Tubing performance including life in a specific application is affected by the materials that come intocontact with the tubing as well as the operating environment. 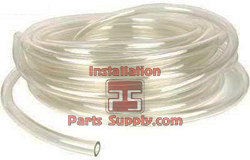 It is the responsibility of the user to determinesuitability of tubing formulation for each application. 4.This tubing is not intended or recommended for medical applications. The use of this product in any medical applicationis solely the responsibility of the OEM and/or end user. 5.To avoid catastrophic disconnecting during use, always use retaining clamps or adhesives when affixing tubingto fittings and/or connectors. 6.The end user should have system back up and adequate procedures in case of tubing rupture. 7.Always carefully read and follow the instructions of the manufacturer of the equipment in use, regardingtubing specifications and instructions for installation. 8.Always carefully inspect tubing for damage prior to shipment and again prior to actual use. When installing tubing or setting up the equipment for use, the end user must always take great care to avoid nicking, cutting, piercing or other damage to lengths of tubing actually used. 9.Tubings are not intended to be used as injection ports. Punctures with hypodermic needles will not resealand depending upon pressure, air bubbles can be drawn into the fluid stream or fluid leaks can occur. 10.No tubing will last forever. This is especially true in peristaltic pumping applications where, uponextended use or improper installation, the tubing will rupture. Carefully set up and monitor each of the foregoing variables during use of the tubing in peristaltic pumps. Read and heed the instructions of the manufacturer or supplier of the pump apparatus in use, regarding tubing installation, pump rollers, guide rollers and raceway maintenance and calibration. Check that proper tubing length is contained in the raceway portion of the pump and that the tubing is not twisted or kinked. Always select occlusion and RPM settings that will achieve the desired flow rate with minimum stress to the tubing. Always constantly monitor the tubing circuit during actual procedures for signs of the tubing beginning to crack, leaks, orair infusion and take appropriate action when observed.